The Timbers Resort offers open water walleye Trips on Lake Gogebic, Lake Superior, and Green Bay (WI) with USCG Licensed Captain Tim Long. We target walleye but catch other species of fish as well. Full day and half day trips are available for up to 2 customers. Full day for 2ppl is $400.00, Half day for 2ppl is $300.00. Rates are subject to change with out notice. Deposits are not refundable if a cancellation is made less than 48 hours prior to your trip. The Timbers Resort offers lodging for guided ice fishing trips. We have plenty of flat surface parking and you will be very comfortable in one of our cabins. Eyes-Guy Fishing Guide Service - Michigan and Wisconsin fishing guide service. Your host and guide Captain Tim Long and his wife Sarah are the owners of The Timbers Resort on beautiful Lake Gogebic in Bergland MI. 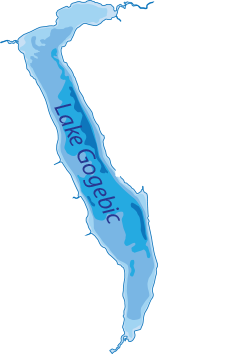 which is located on the North end of Lake Gogebic in Michigan's Western U.P. 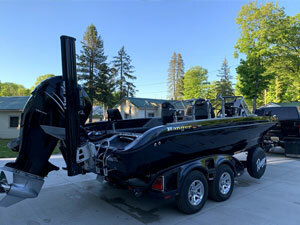 Tim and his family are formerly from Winneconne, WI, where he was a Walleye Fishing Guide for many years on Lakes Winnebago, Poygan, Winneconne, Butte des Mortes, the Upper Fox River, the Wolf River, the Pettenwell Flowage, and The Bay of Green Bay. Tim is continuing to offer his walleye fishing guide service on Lake Gogebic, Lake Suprior, and The Bay of Green Bay for trophy walleye. Lake Gogebic is 18 miles long and up to 3 miles wide providing 13,380 acres of fishing heaven. U.S. Coast Guard licensed Captain Tim Long has spent many years fishing and honing his skills. With his techniques and knowledge of locations needed to fish for walleye, you can be confident that Eyes-Guy Guide Service will put you on fish. While on the water with Tim you will be fishing from the comfort of his 2016 Ranger 621 powered by Evinrude's 300 G2 & a 9.8 hp kicker. © Copyright 2019. Eyes-Guy Guide Service. ALL RIGHTS RESERVED.